Mr. Jerzy Godek has been bound with the company since 2012, initially as the Director of Network Planning and Services Development and then Technical Director responsible for the area of ​​technology development and maintenance. He has over 20 years of professional experience in managerial positions, in the areas of infrastructure investment management, IT support systems and maintenance of the telecommunications network, which he gained in Emitel, Netia, and Telekomunikacja Polska. 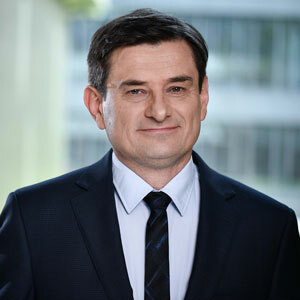 During this time, he was responsible for the implementation of many infrastructure projects, such as the construction of a nationwide network of Digital Terrestrial Television and DAB + Digital Radio network as well as the construction and modernization of a broadband backbone and access network for Netia. He is a graduate of Warsaw University of Technology; he studied at the Faculty of Electronics in the field of Telecommunications and Management. He also studied Finance Management at the Warsaw School of Economics and the Akademia im. L. Koźmiński.